I decided to make these winter months warm by trying out different soups. I didn’t want to eat any of that canned stuff so I said I would make some from scratch. So far, I’ve made two different soups and this one is pretty much what I expected. 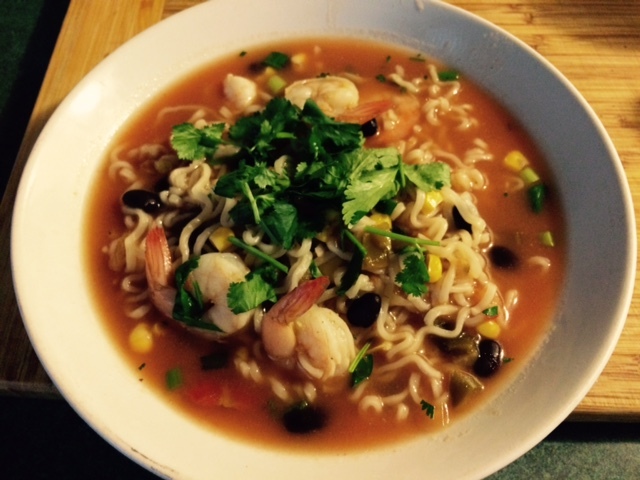 It’s a spicy shrimp soup, precisely called Spicy Shrimp and Noodle Soup, straight out of an old Better Homes and Gardens Quick & Easy Comfort Cooking. I found this old book when I was cleaning out some papers and other unwanted things, and just started flipping through the pages. It’s really sad when you have several recipe books for years that you haven’t even used yet. Thaw out shrimp if frozen, combine lemon juice, chili powder, cumin, and pepper. Add shrimp to mixture; coat it. Let stand for 20 minutes at room temp. Bring water to a boil, stirring in one noodle flavor packet. Break up noodles into pieces and add to pot. Bring to another boil and cook for a minute. Add shrimp; cook until shrimp turn pink. Stir in salsa, beans, corn, cilantro and green onion. Heat through. Serve in bowls, sprinkle cheese on top. So here’s how it turned out. It looks beautiful but I think I over did it with the cilantro. If you’ve never had cilantro, it can be overpowering to a dish depending on your palette. Overall I give this recipe 3 stars. It had a Mexican flavor to it and although I love Mexican food, I really wasn’t liking this one too much. Maybe it was the salsa or the cilantro, I’m not sure. At any rate, it came out the way it was supposed to, but I didn’t make the kids eat it. They are so picky that I didn’t even try to get them to taste it.